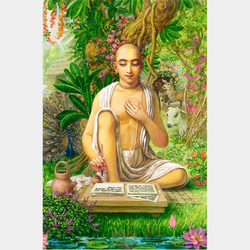 Visvanatha Chakravarti Thakura (c. 1626 – c. 1708) was a Gaudiya Vaishnava acharya born in the village of Devagram within Nadia district, West Bengal, India. His parents were Radhi Sreni brahmanas. He also had two brothers named Rambhadra and Raghunatha. His initiating guru was Shriyuta Krsnacarana Cakravarti of Saiyadabad, Murshidabad, who was fourth in the line from Narottama Dasa. Visvanatha Chakravarti resided with his guru for many years and composed many books during that time. His studies of grammar, poetry and rhetoric were completed while he still lived at Nadia. There is a story that he defeated one conquering pandit while he himself was still only a student. From his childhood he was completely indifferent to household life. In order to keep him at home, his father had him married at a very young age. However, he finally renounced family life and came to live at Vrindavana. His family members tried to bring him back but were unsuccessful. Shri Chakravarti Thakura took up residence with Mukunda Dasa, who lived in Krishnadasa Kaviraja Gosvami's bhajana kutir at Radha-kunda. There he very intently studied the books and letters of the Gosvamis and composed many commentaries on their writings. He used to worship a Deity named Golokananda. 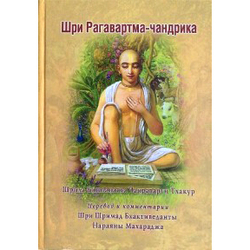 His another name was Harivallabha Dasa. He died on the Vasanta-pancami in the month of Magha.